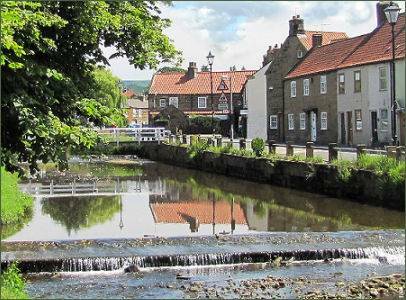 Great Ayton is a large and attractive village, situated at the foot of the Cleveland hills and on the edge of the North York Moors National Park and lies 3 miles (4.8 km) to the northeast of Stokesley. 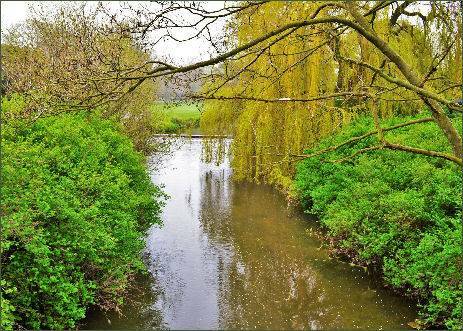 The village's derives from the Old English words Ea-tun, tun meaning farm and ea meaning a river, therefore 'settlement on the river'. The River Leven, a tributary of the River Tees, flows through the village and links its two centres, High Green and Low Green. Great Ayton is of ancient origin, having several Neolithic sites within the parish boundary, and is mentioned in the Domesday Survey of 1086, where it is recorded as being owned by one Eskil and after the conquest by the Norman, Robert Malet (died circa 1106) who became a close advisor of King Henry I and may have died at the battle of Tinchebrai, in Normandy. 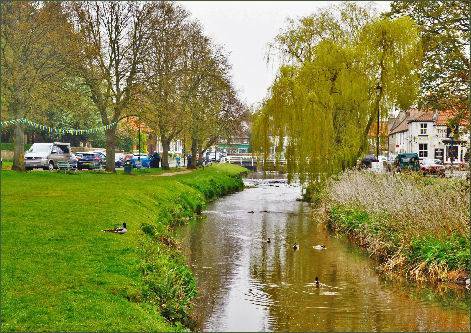 Great Ayton boasts two village greens, the High Green is the centre of the village while the Low Green, with the river running alongside, is a popular picnic place in the summer months. 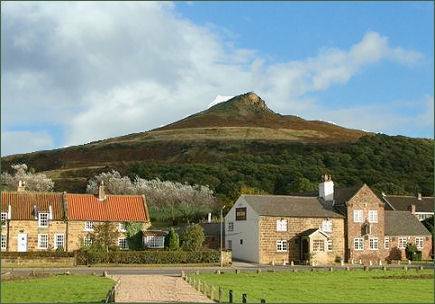 The distinctively-shaped iconic hill of Roseberry Topping (pictured below left) stands beside the village, the hill rises to a height of 1,049 feet (320 metres) and is visible from many miles away. Scandinavian settlers called it "Othenesberg", meaning Odin's Hill. The unique shape is due to a landslip, as a direct result of the extraction of minerals. The Cleveland Dyke, a narrow band of hard whinstone rock that runs for about 31 miles between Robin Hood's Bay and Eaglescliffe lies to the north-east of the village. In the eighteenth and nineteenth centuries Great Ayton was a centre for the weaving, tanning, brewing, and tile making industries, whinstone (a hard igneous rock used in roadmaking) was also quarried from the Cleveland Dyke. There is a Tourist Information Centre, situated in the High Street car park, which provides information on local holiday accommodation. A good range of shops mostly situated in the High Street, as well as restaurants, cafes and public houses. The famous navigator and explorer, Captain James Cook spent his boyhood in the village. He was educated at the Postgate School, founded in 1704 by Michael Postgate, a local landowner. The school has now been converted into the Captain Cook Schoolroom Museum, which is open from April to October and has interesting displays and exhibits, with life like characters in the school room recreation which speak in the local dialect. The Museum also explores methods of teaching in the eighteenth century and the foundation of the Charity School. An audio trail guides the visitor through the picturesque village and looks for signs of Cook’s Cottage, an industrial past, and Quaker roots. The young Cook worshipped in the twelfth century village church of All Saints Church, the family grave is in the churchyard, as is that of Thomas Skottowe who paid Cook's school fees at the Postgate School. The cottage formerly occupied by the family and probably built by Cook's father was dismantled in 1934 and now stands in Fitzroy Park, Melbourne, Australia. The site is now marked by an obelisk built of stone taken from Point Hicks, Australia which stands in a small memorial garden. 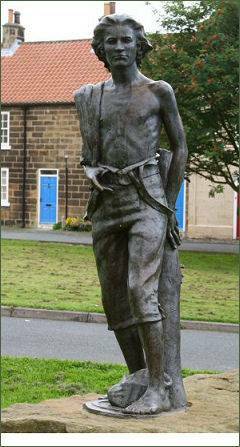 The Captain Cook sculpture which stands on High Green, is the work of the internationally renowned sculptor, Nicholas Dimbleby, and shows James at the age of 16, looking towards Staithes. It was unveiled on 12th May 1997 by Captain Chris Blake. The village hosts a Captain Cook day near the Captain's birthday in October each year, when children race model boats in the river, while a monument to the great explorer stands high above on Easby Moor. The village church, All Saints, was built late in the twelfth century and is the oldest recorded building in Great Ayton. The Grade I Listed building is situated to the west of the present village centre, a short distance from the Low Green. The Domesday Book of 1086 records that there was an Anglo Saxon church in the village, which probably occupied the same site. Although some parts have been changed over the centuries, notably the addition of the porch in the thirteenth century and the removal of the original tower and western part of the nave in 1880, the main construction of the church remains, in the main, unaltered. A fine Norman doorway can be seen on entering the church through the porch . It features a semicircular arch of three orders, the outer being carved with the typical Norman chevron decoration. The chancel contains the only Norman window in the building to survive over the centuries since the building's construction. The font, situated at the back of the nave, dates from the Norman era and has a conical wooden cover. In the recess of a blocked up Tudor window several sculptured stones of pre-Norman era are displayed. Two of these are of particular note, a cross head of late tenth to early eleventh century and a cross head in two pieces. These were discovered near the church and have been accepted as proof that the Anglo Saxon church mentioned in the Domesday Book occupied this same site. The candlelit interior is mostly from the eighteenth century and features a distinctive 3 decker pulpit with sounding board. All Saints' was the main Parish church until is became too small to accommodate the growing village population which lead to the building of Christ Church in 1876.